It was a lovely day, full of warmth and sunshine, so I walked to the beach and jetty to do some sketching and enjoy the sand on my toes. I did get a little frustrated with my people…I haven’t sketched figures properly for quite a while and have really become out of practice. Halfway to Point Lonsdale there are some rocks that create amazing tidal pools, full of shells, seaweed and little creatures. They also reflect the sky beautifully, little colour palettes between sand and sea. They are always on the beach, playing in the tide and searching for tidbits. I’ve been walking longer each time I go out on the beach. Now I am down past the surf club and back.That is about 8 markers each way so a little over an hour’s walk. There are always a few out and about when I am there, particularly around the club, where the surfers and paddle boarders like to play. But wet feet in a good way, I went for a walk along the beach in the morning sun and was enjoying the outgoing tide. There were quite a few people about, walking their dogs or generally having fun on the beach. There was a lot of seaweed floating in the outgoing tide, so I used my rubbish Samsung to get a few snaps for colour and shape purposes. Today we walked from the surf club along the tracks to Barwon Heads to have a coffee in the kiosk. It’s a lovely and easy walk, and we did detour along the beach for a little while. Once at the kiosk, I sat at the top by the jetty and sketched the boats and view of Ocean Grove stretching down the coast. Then on the way back I attempted to draw some of the surfers that were out catching waves on the incoming tide. It was a lovely afternoon. I went into Queenscliff today for a bit of a mooch and to see the Ben Shearer exhibition at the Salt Gallery. It was quite quiet when I arrived…quiet for a sunny day and Mother’s Day at that…so plenty of spaces to park and walk around town. I nipped over to the cliffs, so I could get my lighthouse and jetty fixes for the day. It was getting much busier by the time I left, being lunchtime it is probably not surprising. I actually went for two separate walks along the beach yesterday, one in the beautiful early morn and the other in the wet afternoon. Obviously, dry and calm is much better for photography, though not quite so dramatic in terms of wave height. 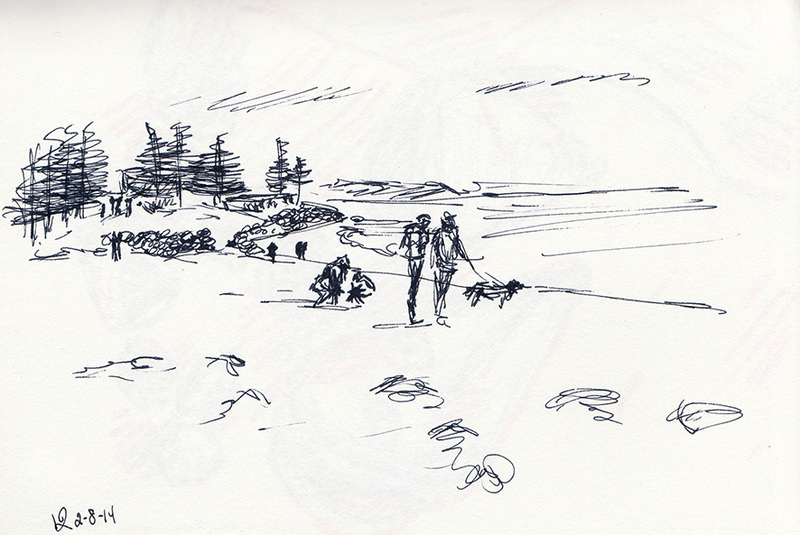 Just a quick sketch from the walk along our section of the Ocean Grove beach, looking towards Barwon Heads. It’s so nice to be back on the beach and enjoy the salty air. I miss that when I am on the other side of the world.